The PEMBANGUNAN JAYA RAYA Badminton Asia Junior Championships 2017 got underway at Gedung Olahraga PB Jaya Raya in Bintaro, Jakarta on Saturday (22 July 2017). This year's championships has set a new record in terms of countries competing in the Asian Junior meet which is the passport for juniors to launch his or her professional badminton - as proven in previous championships. In last year's SCG Badminton Asia Junior Championships held in Bangkok where China won their fourth straight mixed team title only 18 nations took part. 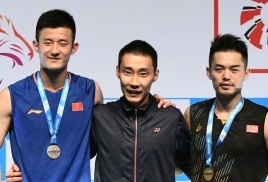 China also swept all the five individual titles at stake - the men's and women's singles. the men's and women's doubles and the mixed doubles for a clean sweep. However, the Chinese are not seeded this year - with South Korea, runners-up to China in the last four mixed final, are the top seeds. Hosts Indonesia are the second seeds with Thailand and Malaysia seeded three and two respectively. China, are ninth in the ranking list but are still considered favourites for the mixed title and also the individual titles. This shows that the rest of the countries are "catching up" - thanks to Badminton Asia's aggressive drive to take the game to all the countries. The Badminton Asia Junior Championships is the perfect grooming tournament for budding young badminton talent as seen in previous championships. Some of the big names that have come through the Badminton Asia Junior Championships and went on to become the Asia (senior) Champions in the singles include Taufik Hidayat (Indonesia), Cheng Hong, Lin Dan, Chen Jin (all China) and Park Sung-hwan (South Korea). In the women's singles names like Jun Jae-youn (South Korea), Zhu Lin, Jiang Yanjao, Wang Yihan and Li Xuerui (all China) went to win Asian titles after winning the Junior title. In this year's championships - Korea, Indonesia, Thailand, Malaysia, Japan, India, Chinese Taipei, Singapore, China, Kazakhstan, Hong Kong China, Vietnam, Uzbekistan, Macau China, Nepal, Mongolia, Myanmar and the Philippines are competing in the mixed team event plus individual events. Pakistan, Sri Lanka, Cambodia, Iran and Iraq are competing only in the individual events which will be held after the mixed team event from July 26-30. After hosting the PEMBANGUNAN JAYA RAYA Indonesia Junior Grand Prix for the past two years the Gedung Olahraga PB Jaya Raya in Bintaro has "upgraded" itself to host bigger international tournaments. The Junior Badminton Asia meet is the first to go into record in this respect. "It is nice and encouraging to note that more and more countries are competing in this (junior) championships. This shows that more countries have embarked to take the shuttle sport to a higher level. "This also shows that our development program is bearing fruits. 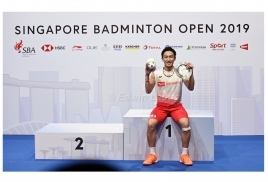 This is what we want...more and more countries giving serious attention to develop the sport in their respective countries," said Chooi Weng Sheng, Administrative and Events Manager of Badminton Asia.